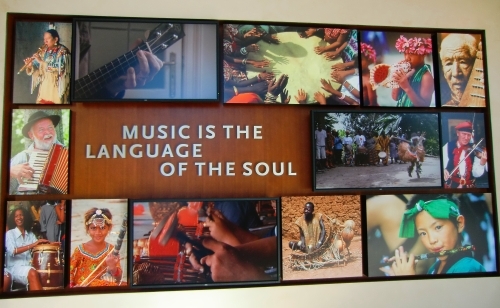 The Musical Instrument Museum in Phoenix, Arizona gives a glimpse into the world’s people through the music we create, love, and dance to. I thought a visit would involve silently walking the halls, staring at clarinets and trombones, and reading standard museum text. Instead, visitors don headphones that come to life with music and narration when an exhibit is approached. Musical diversity appears before your ears and eyes with songs and videos of concerts and dances, colorful displays of familiar and unusual instruments, plus traditional costumes and huge photographs. Children and adults even get a hands-on opportunity to make music with a variety of instruments from around the world. 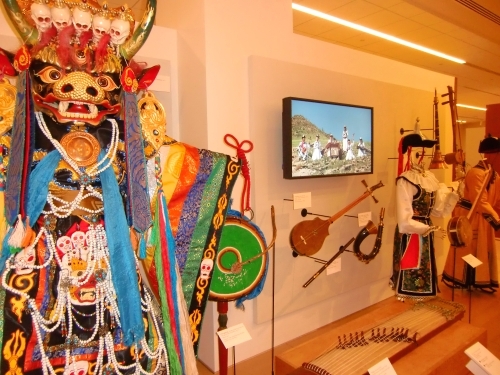 Mongolia’s musical display in the Geographic Galleries features traditional costumes, instruments, and video. Here is an up-close look at Tenovoim (leg rattles) in a Southwest United States display. 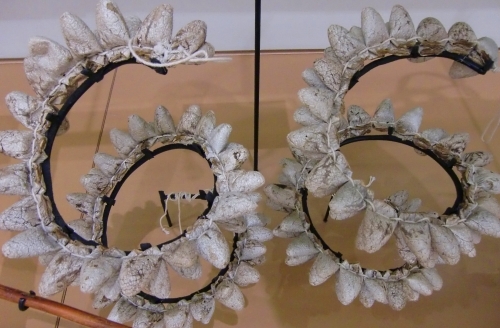 These instruments are made from giant moth cocoons, pebbles, cotton, and animal skin. They sounds like rain when worn by Pascola and Deer dancers. 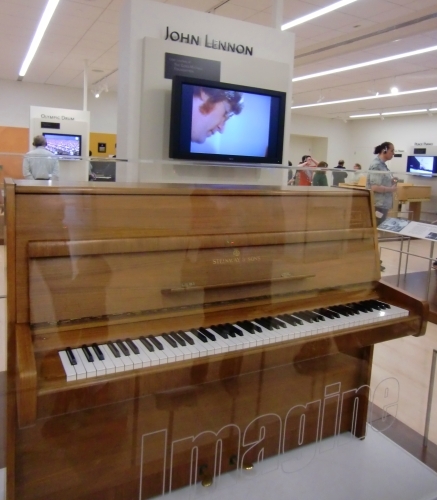 Listen to John Lennon’s “Imagine” at this display in the Artist Gallery containing the upright piano on which he composed the famous song. 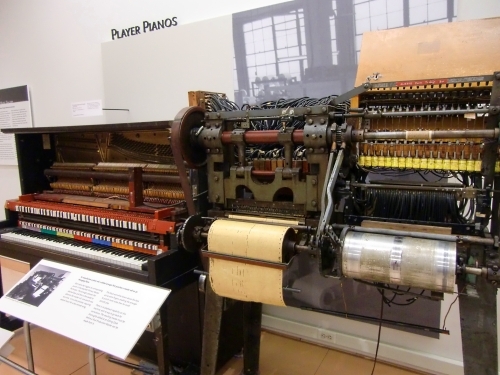 The Mechanical Museum Gallery features instruments designed to play on their own, like phonographs, jukeboxes, and these player pianos. 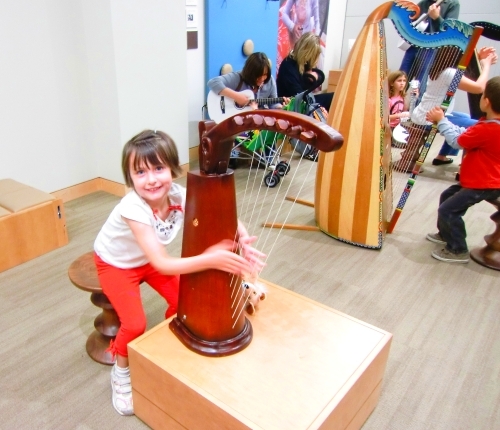 The Experience Gallery provides a noisy and exuberant finale to a Musical Instrument Museum visit. As someone who loves to travel and experience other cultures, visiting this museum was a wondrous buffet of the world’s cultures. You can read about a country’s history and see its artifacts, but to hear its music and watch its people dance in joy – that brings the essence of its people to life. What unique attraction or museum do you recommend to other Travel Mamas and Travel Daddies? Please share your thoughts in the comments! This looks like a really fun place to take children of all ages. I know my two-year-old would love it. Thanks for sharing! The retired president of Target Stores was the leading influence behind the museum. It is really first class. We have been there 3 times and always discover something new. There is even a music theatre where they offer live concerts. This museum looks like so much fun! It’s really such a unique and moving museum!